In the final hours of the final day of the 2019 Legislative session, the Wild Friends bill to protect pollinators, SB 234, passed! Wild Friends students in fourth through ninth grade traveled to the Roundhouse from 11 schools in communities across New Mexico, including Rio Rancho, Albuquerque, Silver City, Las Cruces, Farmington, and Santa Fe, to meet with key legislators about the bill that they helped to create, speaking with them about the importance of protecting pollinators and testifying in committee hearings. If signed into law by the Governor, SB 234 will create a license plate to fund pollinator protection projects on New Mexico’s highways. The license plate will feature pollinator artwork by students, and proceeds from the plates will go to the New Mexico Department of Transportation to plant native flowers and grasses throughout New Mexico. NMDOT will also create demonstration gardens with educational signage at rest stops. 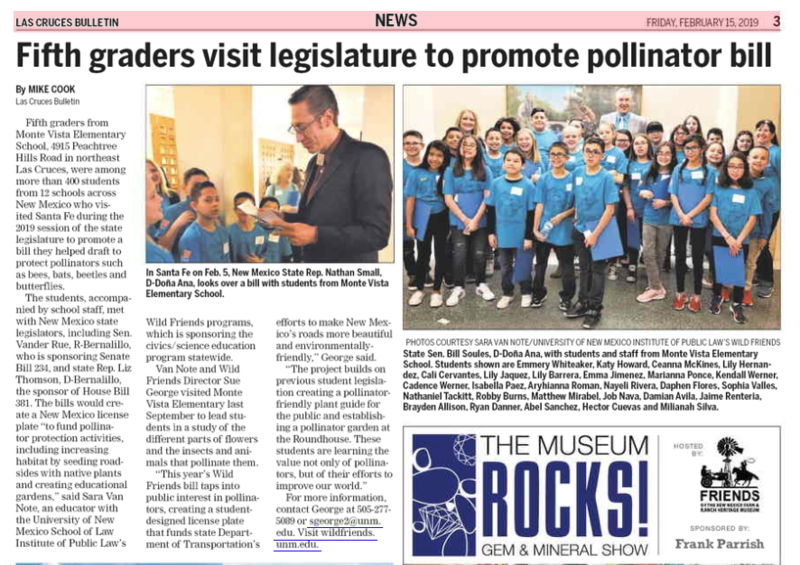 Several local media outlets featured stories about Wild Friends students and their work at the legislature. Wild Friends students from Rio Rancho Middle School and South Valley Academy were guests on KUNM’s Children’s Hour in January to preview the session and talk about their bill. 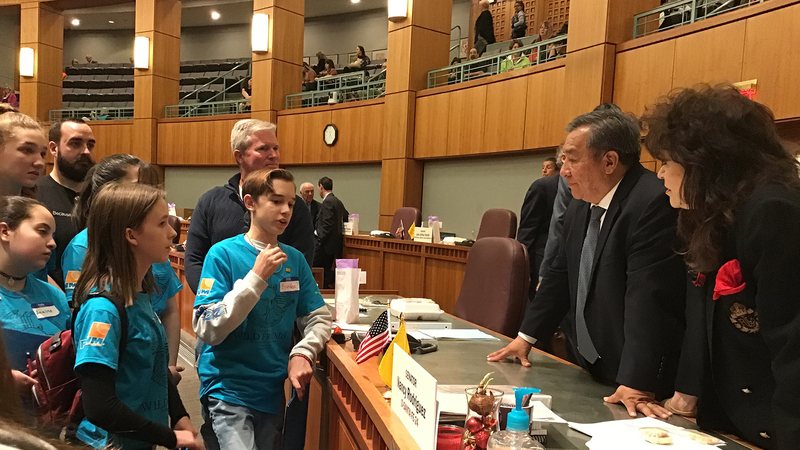 The Santa Fe New Mexican included photos of students lobbying and a mention of our bill in their weekly legislative round-up. The Las Cruces Bulletin reported on Monte Vista Elementary’s field trip to Santa Fe (article below). Las Cruces public radio station KRWG aired an interview with Wild Friends director Sue George and educator Sara Van Note about this year’s program and the importance of pollinators. And the New Mexico Political Report included our bill in their summary of important 2019 environmental legislation. The Wild Friends Program is part of the UNM School of Law’s Institute of Public Law and is funded in part by the Child & Family Justice Initiative (“CFJI”), a project that exists to improve health and well-being outcomes for vulnerable children and families in New Mexico. If you would like to find out more about the CFJI, please contact Sal Guardiola II at 505-277-9065 or at guardiola@law.unm.edu.